ZTE unveiled a 5G fronthaul 200G outdoor OTN product, the ZXMP M721 OD62, for the metro edge. The platform supports 200G connections and employs Flex-O technology to restrict the end-to-end latency within 1 microsecond. 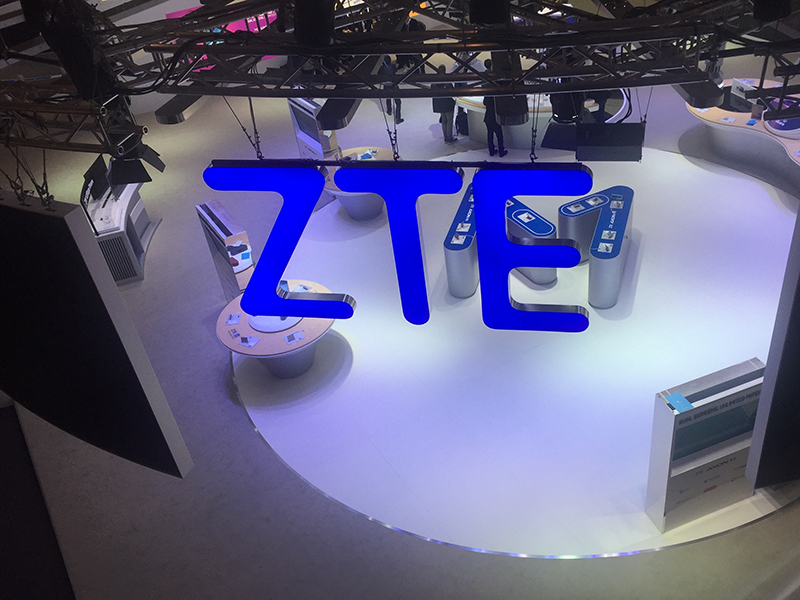 ZTE said its fronthaul solution supports various service access types, including SDH, Ethernet, CPRI and eCPRI to meet the requirements of diversified scenarios. In addition, it supports WiFi debugging, and can automatically implement fast service provisioning, thereby simplifying operation and maintenance. “The ZXMP M721 OD62 demonstrates the world-leading 5G fronthaul transport capability of ZTE OTN products, and consolidates the industry-leading position of the full ZXMP M721 series as the aggregation access layer OTN. ZTE’s ZXMP M721 series has got objective assessment from the global industry analyst firm GlobalData. In the Packet-Optical Access (POA) class, it has again been rated as ‘Very Strong’ in recognition of the largest switching capacity, the highest port density, and the smallest footprint in the industry,” said Mr. Wang Taili, General Manager of ZTE Optical Transport Product. At the Huawei Optical Innovation Forum held this week in Nice, France, Huawei presented its CloudOptiX cloud transport network vision, which calls for more extensive use of optical fiber at the access layer for broadband services and the uses the chain WDM/OTN transmission mode at the transport layer. Huawei's CloudOptiX is aimed at this evolution of transport networks towards next-generation all-optical networks. Alex Duan, Vice President of Huawei's Transmission Network Product Line, said, "Experience is king in the intelligence era. Optical networks need to evolve towards experience-drive networks. The four major continuous technological innovations of Huawei's CloudOptiX solution enable 400G high-performance ultra-broadband pipes, simplified and highly-reliable all-optical switching network architecture, and new OTN technologies that support lower latency, smaller granularities, and more connections. Coupled with the efficient and intelligent O&M enabled by the brain of optical networks, the solution builds the next-generation ultra-broadband, simplified, and intelligent optical networks for operators to improve service experience and achieve business success." Huawei proposes to upgrade CloudOptiX from 100G to 400G. Huawei's proprietary CMS algorithm supports the evolution to 400G and beyond while maximizing the performance potential of optical components, maintaining a distance 20% further than the industry average. Huawei has launched a unique 200G CFP high-performance compact optical module, which is half the size of the industry average and has a power consumption that is 45% lower than the industry average. In optical transport, Huawei's next step is to deploy WDM devices at the network edge to transform "pipes" to "service bearer networks" through end-to-end OTN. On the backbone layer, all-optical network 2.0 uses optical cross-connect backbone nodes to break the ceiling of cross-connect capacity in the electrical domain. Microsemi is working with China Telecom Beijing Research Institute to define and develop next-generation optical transport solutions for 5G. China Telecom is leading the Next-Generation Optical Transport Network Forum (NGOF) consortium formed to drive industry collaboration and technological innovations to define converged optical transport network (OTN) which meet the needs of 5G deployments. 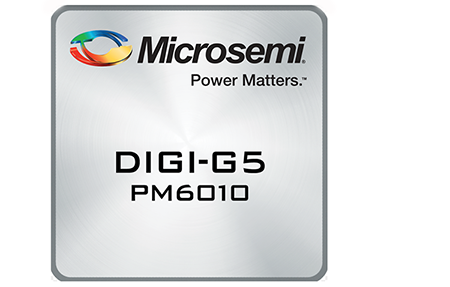 As part of this collaboration, Microsemi is bringing to market the DIGI-G5, the newest member of its DIGI OTN processors, supporting new 5G optimized architecture that enables the stringent synchronization, latency and network slicing requirements being placed on optical networks to support 5G deployments. Microsemi said its new 5G optimized architecture of the DIGI-G5 reduces the total latency for single hop close to 1 microsecond. In addition, the DIGI-G5 integrates close to two terabits of on-chip ODUk switching for hard traffic isolation and grooming in support of network slicing. DIGI-G5 also delivers nanosecond level time stamping accuracy and provides mechanisms to carry critical timing information over the OTN network, ensuring that platforms will meet Precision Time Protocol’s (PTP’s) Class C requirements. 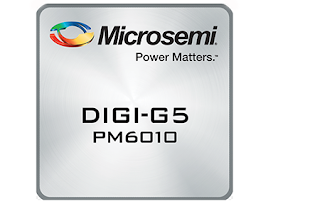 Microsemi introduced its DIGI-G5 Optical Transport Network (OTN) processor for terabit capacity OTN switching cards. The company said this newest generation in its DIGI franchise enables packet-optical transport platforms to triple in capacity while slashing power consumption by 50 percent per port. DIGI-G5 delivers 1.2 terabits per second (Tbps) of combined OTN and client interfaces and is first to market with newly standardized 25 Gigabit Ethernet (GE), 50GE, 200GE, 400GE, Flexible OTN (FlexO) and Flexible Ethernet (FlexE) with integrated security engine enabling flexible encrypted optical connections. Transporting Ethernet, storage, intellectual property (IP)/ multiprotocol label switching (MPLS) and 4G/5G Common Public Radio Interface (CPRI)/eCPRI services over 100G OTN switched connections has proven to be the most fiber, power and cost-efficient deployment solution for moving bits in today's metro and long-haul networks. Innovative DIGI-Mesh-Connect architecture which enables compact, pay-as-you-grow OTN switching at lowest cost and power by eliminating the need for a centralized switch fabric device. Nokia has secured the #1 vendor role in a central bid to supply equipment for China Mobile's regional optical transport network. 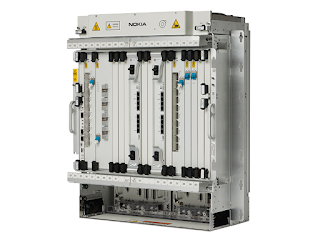 Specifically, China Mobile has chosen Nokia to provide an integrated IP/optical solution for 13 city metro and two provincial backbone networks. 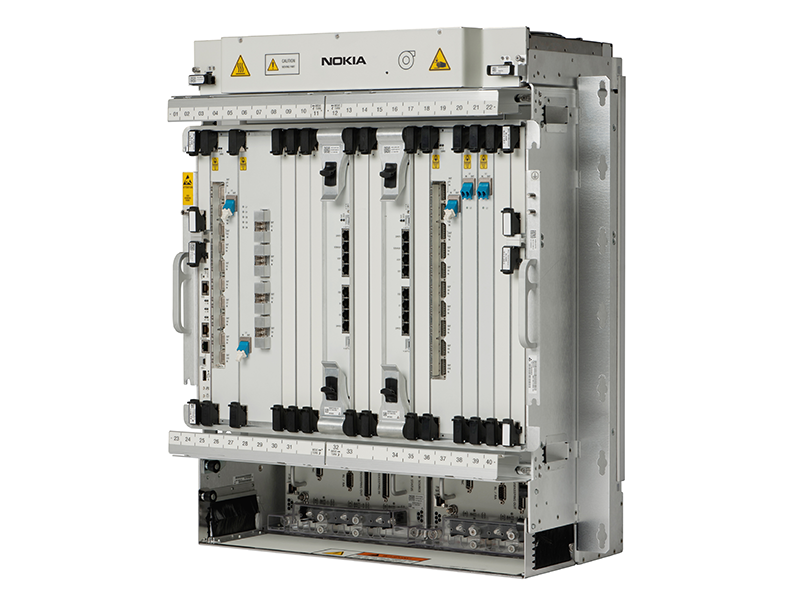 The network includes Nokia 1830 PSS-24x platform, a highly scalable packet/OTN multilayer switching platform. Deployments are underway. Financial terms were not disclosed. China Mobile's new optical transport network will support its next-generation of network services, especially 5G. Yu Xiaohan, head of the China Mobile customer team at Nokia Shanghai Bell, said: "We are very pleased to work closely with China Mobile to provide the optical technology for its most advanced networks today and in the future. We'll continue to fulfill our mission by making people's life easier as we create the technologies that connect the world." SM-Optics, a technology developer based in Milano, introduced a single chip OTN switching matrix that scales from 300 Gbps to 1 Tbps. The company said its FLEX device can be addressed by ports spanning from traditional low-speed services like 2Mbps over micro-OTN, to layer2 and layer3 over ODUFlex, 100G over ODU4 and 200G over FlexO. Embedded capabilities include multi-technology OAM, packet processing, synchronization and fast protection functions. The FLEXSET boasts low latency performances and features an Intel Stratix 10 FPGA. 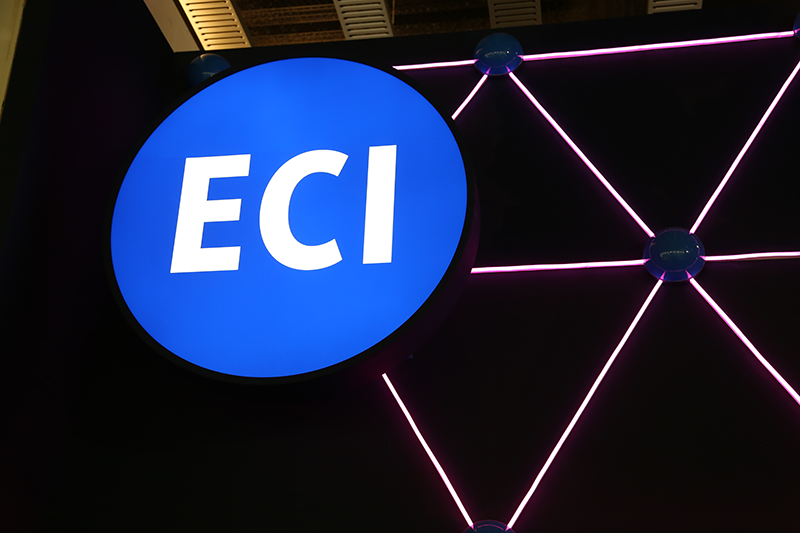 Ciena is supplying its converged packet optical and software platforms to transform the network of the Israel Electric Corporation (IEC). The upgrade to 100G and OTN switching equipment enables IEC to respond to the growing demand for IT and telecommunications services, as well as to build and deliver secure high-speed broadband services for private overlay networks. 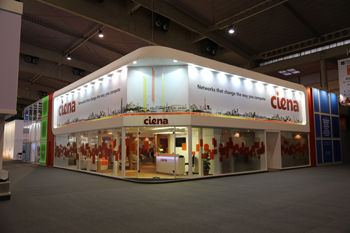 IEC will use Ciena’s 6500 Packet-Optical Platform to power a 100G DWDM OTN-switched core network . Ciena’s WaveLogic Encryption will provide protection of critical in-flight information. IEC will also use Blue Planet’s Manage, Control and Plan (MCP) software for unified network management and end-to-end service provisioning and planning. Financial terms were not disclosed. ECI, launched of its Apollo OPT9904X for extending the benefits of OTN switching to metro networks that often have fluctuating, variable demand. ECI said its new platform enables metro optical networks to deploy OTN switching exactly where, when, and in the amount required to enjoy improved efficiency and flexibility. the OPT9904X the most elastic and cost-effective overall solution for OTN in the metro. The OPT9904X also integrates packet services, generating savings by aggregating L2 traffic and reducing the number of costly router ports. 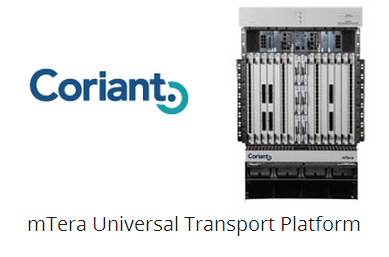 Coriant announced that 1&1 Versatel, a major provider of data, Internet and voice services in Germany, has deployed the Coriant mTera universal switching and transport solution to increase the capacity and enhance the bandwidth management capabilities of its nationwide high-speed optical backbone network. The Coriant solution, which includes advanced OTN switching and end-to-end network management functionality, is designed to enable 1&1 Versatel to cost-effectively meet increasing customer demand for network bandwidth while enhancing service delivery across the country. The 1&1 Versatel high-capacity national fibre backbone network extends over more than 42,000 km, the second largest network in Germany, and supports a range of business and residential communications services via support for high-speed data transfer at speeds of up to 100 Gbit/s, upgradeable to 200 Gbit/s. To maximise utilisation of its fibre assets and enhance the resiliency, scalability and flexibility of its broadband services, 1&1 Versatel has deployed Coriant's mTera platform in major backbone sites across Germany, and is currently extending the deployment to its regional fibre networks. Designed to enable network modernisation, the Coriant mTera solution will enable 1&1 Versatel to aggregate, groom and transport diverse traffic types, while supporting the cost-effective migration of legacy traffic, including SDH. mTera is a flexible multi-service transport solution that offers support for software-defined universal switching, including OTN, Carrier Ethernet, MPLS-TP and SONET/SDH in a single system architecture. The mTera platform supports 7 Tbit/s of universal switching capacity per shelf, with up to 12 Tbit/s of total switching capacity per rack. In addition, provisioning and management of service capacity in 1&1 Versatel's backbone will be provided by the Coriant Transport Network Management System (TNMS), which helps to reduce operating expenses and improve service resiliency leveraging end-to-end network control, automated provisioning features and advanced planning capabilities. ZTE announced at MWC 2017 the release of the E-OTN solution and demonstrated what it claims is the first commercially available Carrier DevOps platform. ZTE's E-OTN solution is designed to address the demands of services such as 'big video', wireless, government and enterprise private line, data centre interconnect (DCI) by enabling operators to build high-capacity, lowlatency, secure multiservice transport OTN systems, as well as transition from OTN to all-optical networks. The ZTE end-to-end E-OTN solution supports functionality including express pass in the optical layer, unified transport of optical channel data unit/packet/virtual container (ODUk/PKT/VC) and is designed to enable more elastic network architectures. The E-OTN family comprises the ZXONE 9700 series, ZXONE 8000 series and ZXMP M721 series products, which feature intelligent control plane, optical cross-connection (OXC), packet processing and OTN technologies and offer support for 100 Gbit/s-plus transport and electrical cross capacity of 64 Tbit/s. The solution also provides colourless-directionless-contentionless Flexgrid (CDCF) and ROADM capabilities to allow transparent transport, flexible dispatching and convergence. 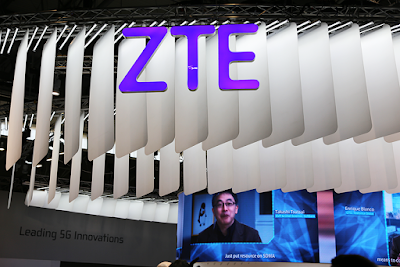 ZTE has announced at MWC the launch of what it claims is the first commercially available Carrier DevOps platform and conducted a demonstration based on the DevOps workflow designed to showcase the capabilities of the DevOps operational environment and network slicing. 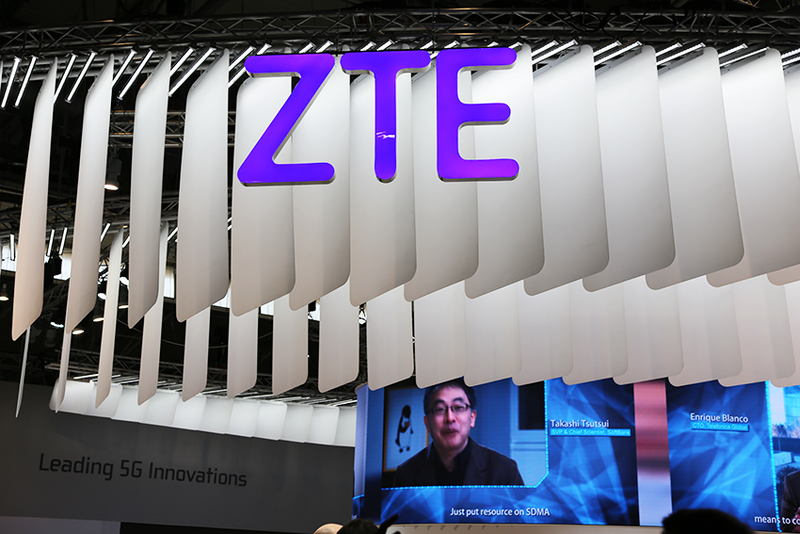 ZTE noted that it debuted the Cloud Works (carrier DevOps) solution at MWC last year and the solution is now ready for commercialisation. The Cloud Works solution is based on open virtual network function (VNF) micro-service components, DevOps tools and Docker technology and is designed to enable flexible development with continuous integration and delivery of services to support on-demand customisation and rapid service introduction. ZTE network slicing, based on the carrier DevOps environment, integrates the features of second-class elasticity, minute-level deployment and wizard-based design, while also providing an end-to-end view of the slicing lifecycle, AI-based Ops deployment and maintenance environment. These capabilities are designed to improve the efficiency of both network deployments and operations and maintenance (O&M) processes. Cisco rolled out a number of enhancements to its optical transport portfolio including high-density time-division multiplexing (TDM) to IP/MPLS capabilities. Cisco Network Convergence System (NCS) 4200 Series: Part of the Cisco Evolved Programmable Network (EPN), this transport system addresses network inefficiencies with high-density circuit emulation technology located at the network edge. It converts TDM services into pseudowires that facilitate transport over highly scalable MPLS core networks. With this technology, service providers can keep their existing operational models and service revenue while running all services over IP and retiring their older networks. Service providers can reduce space and power required over existing solutions by up to 90 percent. Multi-service line card for the Cisco NCS 4000 Series - a new, multi-service line card that doubles slot bandwidth to 400Gbps, while providing port-by-port, pay-as-you-grow flexibility for OTN, Packet, MPLS and Coherent DWDM service. When deployed in the Cisco NCS 4009 and NCS 4016 platforms, chassis density doubles to 3.6Tbps and 6.4Tbps, respectively. 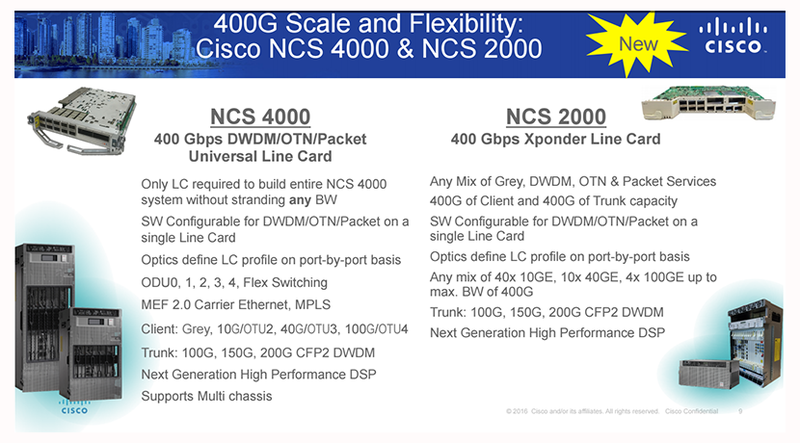 The NCS 4000 Fabric is also enhanced to help enable unprecedented in-service scale from a single Cisco NCS 4000 chassis (6.4Tbps) to a Multi-Chassis solution capable of delivering over 100Tbps of capacity leveraging Cisco’s multi-chassis leadership. Increased density and flexibility for the Cisco NCS 2000 Series: New XPonder line card provides 400 Gbps of client and 400 Gbps of trunk capacity to Cisco’s widely deployed optical transport platform. The XPonder supports OTN, packet and coherent DWDM while contributing significantly to cost reduction – one line card for any mix of DWDM, gray, OTN and packet services. 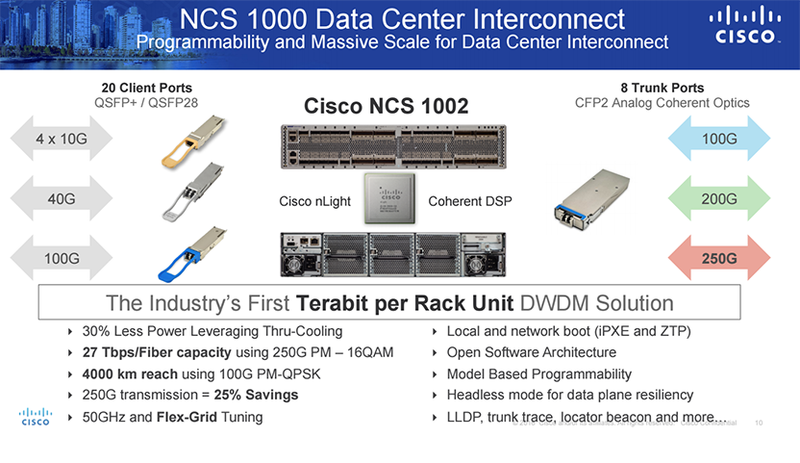 Cisco NCS 1000 data center interconnect solution - commercial shipment is now underway. Cisco said the DWDM solution is now in trials with 9 top cloud providers. Cisco also confirmed that Verizon will deploy the Cisco NCS Series on portions of its 100G metro network. Microsemi announced mass production of its DIGI-G4, its latest DIGI Optical Transport Network (OTN) processor enabling the transition to 400G OTN switching solutions in metro transport networks. Microsemi's DIGI-G4 enables network equipment vendors to double the 100G OTN port density on their optical transport systems, while achieving a 50 percent reduction in power per 100G port. "We have been working very closely with some of the world's leading original equipment manufacturers to complete Carrier qualification of their 400G OTN designs," said Babak Samimi, vice president and business unit manager of Microsemi, Communications business unit. "This year we will see our DIGI-G4 deployed in networks worldwide as the key technology for driving the transition to 400G OTN switching, in addition to enabling a new wave of flexible optical transport infrastructure that is software-defined networking (SDN)-ready and delivers on the security needs being demanded for cloud-connectivity powered by our embedded encryption engine." In January 2016, Microsemi completed its acquisition of PMC-Sierra in a deal valued at approximately $2.5 billion. PMC-Sierra has commenced sampling of its new DIGI-G4 chip -- the industry's highest density 4x100G OTN processor and featuring 50 percent less power per port than the previous generation. The DIGI-G4 OTN processor, which builds on the success of PMC’s DIGI-120G, enabling the transition to 400G line cards in packet optical transport platforms (P-OTP), ROADM/WDM and optimized data center interconnect platforms for OTN switched metro networks. It increases 10G, 40G and 100G line card port density by 4X with flexible client mapping of Ethernet, storage, IP/MPLS and SONET/SDH, while reducing power by 50 percent per port. DIGI-G4 builds on the IP from DIGI-120G, enabling customers to maintain their rich feature set and software investment, which reduces time to market by up to six months and lowers development costs. Significantly, DIGI-G4 delivers multi-rate, sub-180ns latency OTN encryption, allowing cloud and communications service providers to ensure security without compromising performance. DIGI-G4 supports sub-wavelength OTN encryption and is compatible with OTN switched networks. 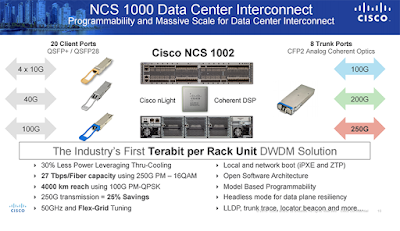 PMC said these these capabilities, combined with the densest 10G/40G/100G Ethernet ports, enables a new class of low-power, high-capacity transport platforms optimized specifically for the hyperscale data center WAN interconnect market (see whitepaper). PMC introduced its META-240G, its third generation, multi-rate OTN/Ethernet framer for routers. This next gen converged OTN/Ethernet 10G/40G/100G router PHY enables 2X scaling of router line cards. New capabilities in this META-240G generation include an integrated 100G gearbox for interfacing directly with optical modules, including the new high-density QSFP28 transceivers. 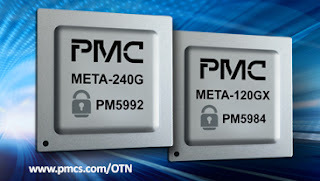 PMC also added ultra-low latency OTN encryption, which is targeted at point-to-point, secure data center interconnects or multipoint, secure cloud connectivity. The new silicon also consumes 50 percent less power per port than the previous generation. Leverages common Software Development Kit across META and DIGI family code base. The PM5990 DIGI-G4 is sampling now. 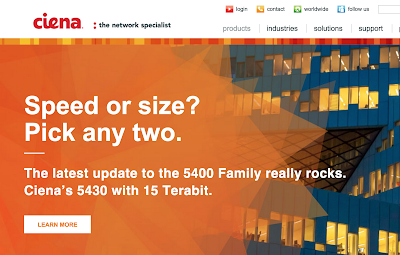 Ciena's newly upgraded 5430 provides up to 15 Terabits (Tbps) of capacity to service provider, submarine and cable networks. The upgrades, which are powered by Ciena’s next-generation family of silicon chips, provide up to five times more port density, four times switching capacity and 60 percent reduction of power consumption per switched Gb/s than the current platform – all in the same footprint and with in-service upgrades to mitigate service interruption. Each port can be individually programmable to operate in QPSK or 16QAM modulation, enabling providers to maximize capacity for any reach with a single card. In addition, a new set of packet networking features has been introduced on the 5430 to offer rich Metro-Ethernet-Forum(MEF) based services for consistent service delivery, faster turn-up and provisioning, and seamless evolution from circuit to packet. 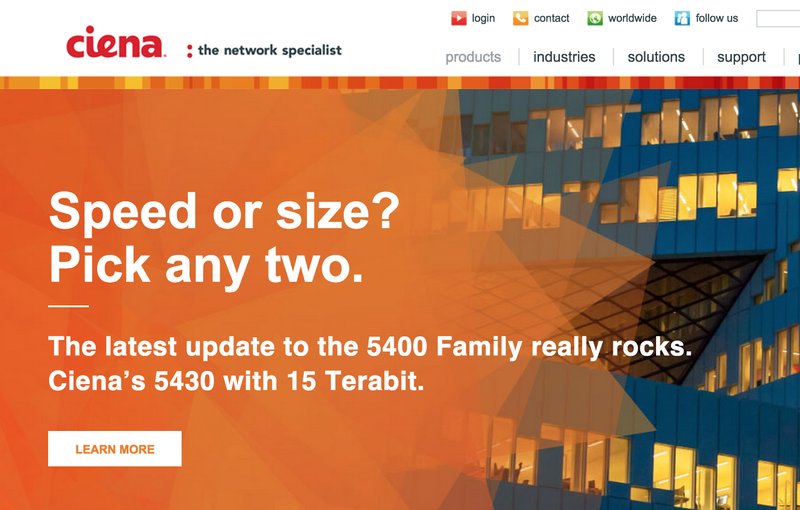 Utilizing Ciena’s field-proven OneConnect Intelligent Control plane, the 5430 also provides greater network agility and automation by offering intelligent software to optimize operations and reduce costs, accelerate service turn-up and set the foundation of a more dynamic network infrastructure. Ciena confirmed that the enhanced platform is currently being deployed by a number of leading service providers globally, including SK Telecom, Korea’s largest telecommunications company, to support mobile and next generation business and consumer broadband offerings. PMC-Sierra unveiled an OTN-based solution for fronthaul networking in Centralized Baseband RAN (C-RAN) architectures used for LTE and LTE-Advanced systems. The OTN solution meets the 3GPP specifications for end-to-end latency and jitter while multiplexing multiple CPRI signals onto a single 10G wavelength. 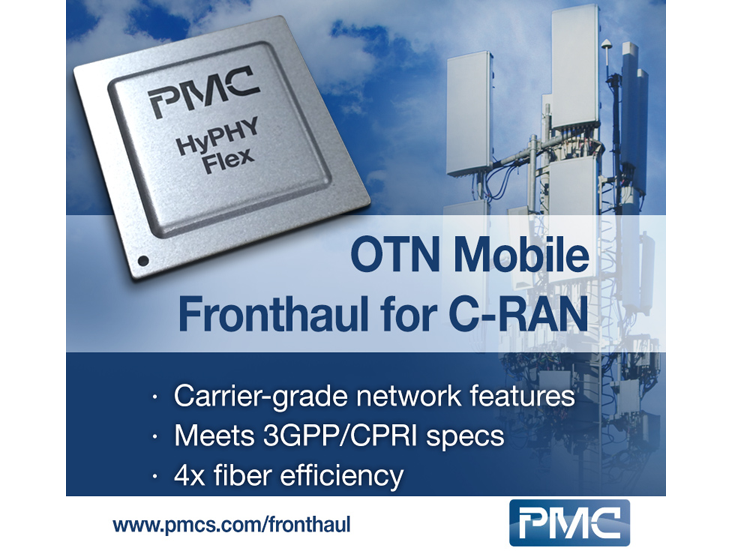 PMC said this OTN fronthaul architecture substantially reduces fiber consumption in the access network. The company is offering a reference design based on its existing HyPHY 20Gflex and HyPHY 10Gflex devices. The global optical transport network (OTN) market totaled $4.3 billion in the first half of 2014 (1H14), an increase of 9% from the first half of 2013 (1H13), however sales of OTN switching gear jumped 35% in the period, according to a new report from Infonetics Research. Telefónica has selected Alcatel-Lucent’s 1830 Photonic Service Switch (PSS) a 100 Gbps optical network throughout the north-west, eastern and southern regions of Spain. The backbone will enable Telefónica to improve the capacity of its regional networks to meet rapidly growing consumer and business demand for high-speed, ultra-broadband Internet connectivity. Financial terms were not disclosed. Alcatel-Lucent said its DWDM solution with integrated OTN switching and aggregation will support increasing traffic created by video and cloud applications. The network has 8.8 Tbps of capacity and is ready to grow to 24 Tbps. The network will offer auto-restoration features based on a GMPLS control plane in every regional domain to advance reliability and uninterrupted quality of experience for customers. Anritsu introduced an all-in-one optical field instrument with the ability to conduct Optical Transport Network (OTN) mapping of all client signals as well as multi-stage mapping in a lightweight, small portable package. The MT1000A Network Master Pro is an all-in-one OTN tester that provides users with the capability to measure with Ethernet and SDH/SONET client signals, making it easier for technicians to install and maintain mobile and fixed-access, metro, and core transmission networks. It supports the new OTN features ODU0 and ODUflex, as well as Ethernet, Fibre Channel and SDH/SONET at rates up to 10 Gbps. Legacy PDH and DSn interfaces can also be measured with the MT1000A Network Master Pro. Field technicians can use the instrument to quickly and accurately locate and solve problems in the transport network without having to contact a remote network operations center. "Modern networks are utilizing enhanced packet optical transport technology such as OTN to support robust, fault tolerant transport of native Ethernet- and TDM-based clients over optical meshed networks. Additionally, Fibre Channel has grown significantly to meet the demand for data center connectivity and storage area networks (SANs). 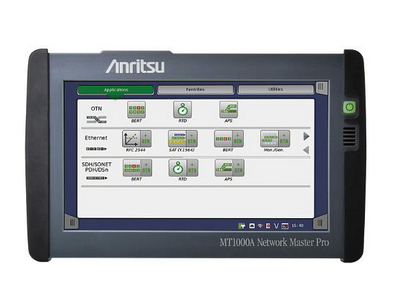 Anritsu has developed the MT1000A to support the network operator, administrator, engineer, and technician who must measure existing client traffic as stand-alone native signals as well as encapsulated clients in OTN transport," said Pete Alexander, PhD, Vice President and General Manager of Anritsu Company. 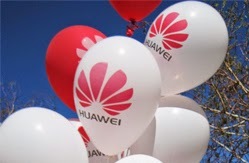 Etisalat is conduction a trial of Huawei's 400G OTN on its commercial network in the United Arab Emirates. In addition, Etisalat has been testing advanced mobile broadband technologies and 40 Gbps GPON from Huawei. "With Huawei’s 400G technology, Etisalat’s existing network asset has proven its capability of supporting future, next-generation transmission technology, and are fully committed to enhancing our ability to support traffic growth demand from our customers," said Esmaeel Alhammadi, Vice President of Network Development, Etisalat. "Both Huawei and Etisalat share a vision of enabling a better connected world for our regional customers. Through our latest partnership on the 400G OTN trial, we have set the stage for increasing access to the modern information society with intelligent management capabilities," added Alan Wang, President of Huawei Etisalat Global Key Account.